Mobile augmented reality (MAR) services allow a user to interact with virtual information in the real word through the user interface (UI) of his/her mobile device. However, it is necessary to introduce augmented reality (AR)-related usability principles when developing and designing MAR services to ensure that they conform to the usability principles and provide user experiences that meet users’ expectations. On this basis, the present study designed an MAR application aimed at product marketing and providing an interactive experience based on the usability principles. In addition, experts were invited to measure the usability of the system based on a mobile-specific heuristic evaluation checklist. 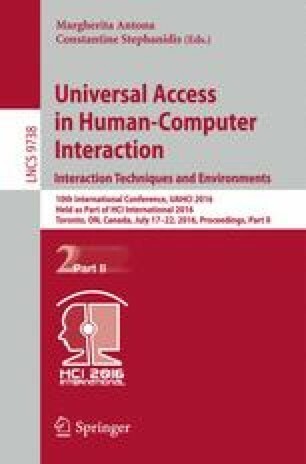 The results demonstrated that the MAR application designed in the present study met the system usability requirements and could provide users with a positive experience during their interactions with it. We thank all of the individuals who participated in the study. This research was funded by Taiwan Metal Industries Research & Development Centre, Chang Gung University, and Taiwan Ministry of Science and Technology Ministry (MOST103-2221-E-182-051-MY2).